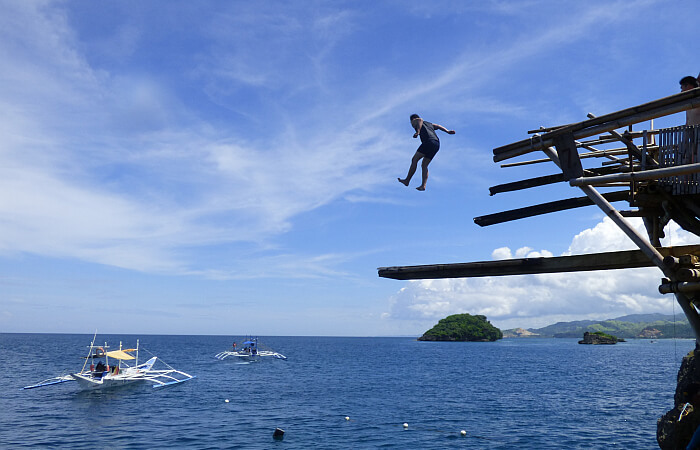 A writer who was less than impressed with the Philippines in his backpacker youth visits Boracay as a tourist and finds a whole other dimension. We sit down at a long table where a row of banana leaves is topped with rice. Atop the rice is an array of pork, shrimp, fish, and more. This is a Boodle Fight meal, with roots in the Philippine military. The idea is that everything is laid out and you fight for your share, eating with your fingers only. 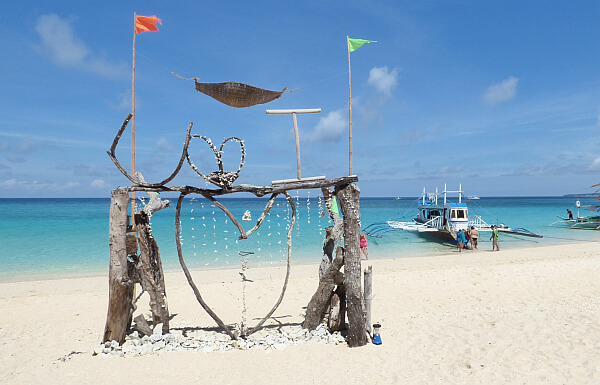 Outside the glass wall is a beautiful white sand beach and blue water beyond with outrigger sailboats gliding by. It's a beautiful scene that is pleasing all five senses at once. This is definitely not the same Philippines I experienced as a young backpacker. Back then, in the midst of our third trip around the world, it was a country where we were largely glum. "Why in the world did we extend our visa?" we would ask each other after another hellish day of travel. "Why are we still here?" When people would ask us later what we thought of the Philippines, there was always a "but..."
"The rice terrace areas around Batad were fantastic but..."
"Northern Palawan and the little islands around there were beautiful, but..."
The room temperature food lacked imagination. The hotels were always disappointing and overpriced compared to those in Vietnam and Indonesia. Getting around by land and sea was seldom easy or comfortable. Once our haphazardly loaded ferry lilted to the side for our two-hour ride—in a country where ferry capsizings seem to be in the news every year. The running joke about all the Jesus figures in the jeepneys was that the drivers bought those and prayed instead of paying for maintenance. In every ugly city, post-WW2 urban planning could apparently be summed up as: "F%#k it, just build something." This was all in 1997 though, so I am ready to give the country a second chance. For every detractor there's at least one cheerleader and the Filipinos are some of the proudest citizens you'll find anywhere. They greet every problem with a smile and seem almost impossible to rattle. So after a conference in Manila where I was speaking about productivity for bloggers, I go on a post-trip with the tourism board to see Boracay Island like a non-productive tourist would. The first upgrade is easy: flying instead of the whole day it would take going overland. After we touch down at the airport, there is a van ride, a boat ride, then another van ride, but it is all done efficiently and with big smiles. A welcome drink, a beautiful room, a view of the impossibly beautiful water off the powdery sand beach. A cheerful man in a crisp uniform delivers chocolates after a knock at the door. Apparently, this is how those spending hundreds of dollars a day instead of tens of dollars per day start their arrival. The group I'm with gets on a local paraw traditional sailboat and sails off into the sunset. We're splashed with water but it's warm. The salty air whips past us as the full sails speed us across the water like the original islanders. Those original sailors probably weren't greeted by beach vendors selling trinkets as soon as their boat hit the sand, but we're too elated from the experience and the gorgeous sunset to be bothered. That night, after well-crafted cocktails with local ingredients and a dinner with Italian ones, three of us take off for a pub crawl on the main strip. When I toured the country on a shoestring budget, we kept the binge drinking down to aid the budget, but this time beers are a shade more than a U.S. dollar and at this point in my life I'm earning real money. After strolling past a few bars that aren't quite right, we find one with a fire dancers show going on and head inside. Twenty years ago, I would have scrutinized the menu prices in hesitation. Now it's just, "This place looks fun" and we take a seat. As the club beats pump and the fire juggle their flaming batons, we sip San Miguel beers with our toes in the sand. That's what most people think travel writers do all the time, of course. We sit in lounge chairs on a beach writing up our notes and thinking of clever ways to describe what we're doing while "getting paid to travel the world." I'm on a press junket though, which means cramming every possible thing that can be done in a tourist location into three packed days. Our perky guide has us up early the next morning so we can wade out to a boat. We're about to do everything most visitors would do in a week or two. Some tourists will come to Puka Beach and hang out all day, maybe writing their philosophical travel notes as they stare off at the horizon. We have no time for that though. After a quick look around we're off to the next stop in the boat, then the next, the highlight being jumps off a cliff from diving boards at different heights. They go three meters, six meters, then eight through ten. Here the group splits into "there are two kinds of people" mode. The jumpers whoop and go for it without hesitation. The others take photos. We hike back across Magic Island, past the Korean families having picnics with rice balls and soju. On the boat we ride past giant floating playgrounds to a floating platform on the ocean water. Here we find giant plastic globes with tubes attached and young men running around with clipboards full of waiver forms. We're going helmet diving.